Many readers of this blog are already familiar with our daily broadcast, Renewing Your Mind. Since 1994, Dr. R.C. Sproul, and more recently including the Ligonier Teaching Fellows, have provided accessible, in-depth Bible teaching to millions around the world. In fact, as the principal outreach of Ligonier Ministries, this radio broadcast and podcast is how a lot of you were first introduced to us. Over the years we have recorded over a thousand hours of Bible teaching. Now, to supplement our usual Renewing Your Mind broadcast, we are launching Renewing Your Mind Minute. Mining the riches of Dr. Sproul’s teaching ministry, we are podcasting those “gold nuggets” sprinkled throughout to provide you with short insights on Reformed theology and the life-changing truths of historic Christianity. Renewing Your Mind Minute is updated three times each week. Subscribe for free (iTunes or feed). 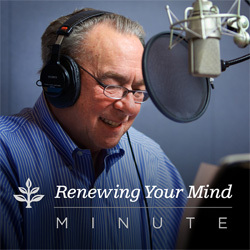 Our daily Renewing Your Mind broadcast is also available as a 23-minute podcast (iTunes or feed).